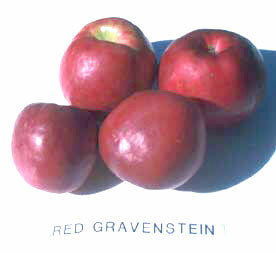 Old cultivar of Grasten Denmark, over 200 years. Very susceptible to the virus twist (flat limb, gnarl), moderately susceptible to scab and mildew. Earliblaze, Scotia. Triploid variety so will not reciprocate with pollen for pollinator variety. Red strains flower at same time but will not cross-pollinate each other. Striped red on part of surface. At Orange, end of January to early February; at Bilpin, late December. Ripens very unevenly over the tree. Jackes - Red strain from Mr Jackes, Australia. 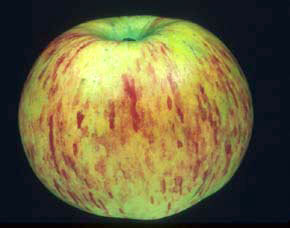 Similar shape but sometimes a little smaller; striped red over 70–100% of surface; attractive. Red - Virus-tested source. 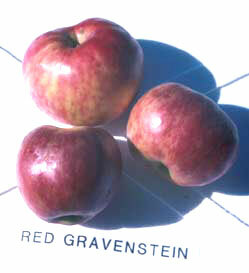 Similar to ordinary strain but often less flat; smooth red skin but not too blotchy. Theissen - Red strain from Mr Theissen, Australia. Flat conical as for the ordinary strain; smooth red but not too blotchy.